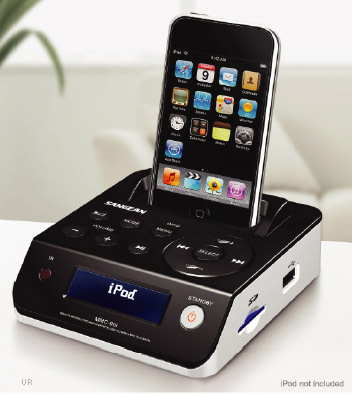 The Sangean MMC-96i iOctopus is a multi-function remote interactive iPod docking pad with USB/SD WMA/MP3 Playback. This expands the possibilities for enjoying your iPod's music. The iOctopus MMC-96i can also be used with all amplified speaker systems and other products with a 3.5mm stereo line output. You can play and control your iPod™ through the iOctopus full-function 8 button system and through the supplied infrared remote control. When your iPod™ is docked you can listen to your iPod™ music while it is recharging. FAT 16 / FAT 32 file system. Maximum of 65536 files and a maximum of 999 folders. Supports SDHC to 16 GB. iPod™ shown is not included.